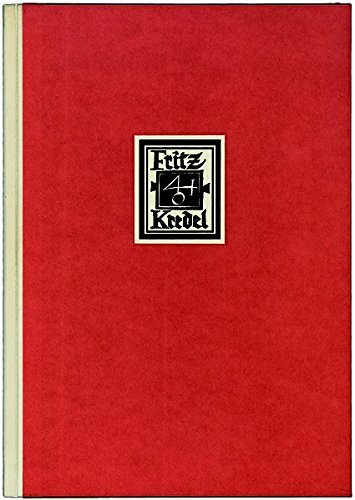 Fritz Kredel: Das buchkunstlerische Werk in Deutschland und Amerika. Edition limited to 550 copies, of which this is one of 520 copies in this binding. Fritz Kredel was born in Michelstadt in Germany in 1900. For political reasons he emigrated to the USA in the 1930s, where he died in New York in 1973. He is an uncommon figure in the history of book art because he moved apparently effortlessly in, and between, two cultures. On both sides of the Atlantic Ocean he created an extensive oeuvre that is equally appreciated in Germany and in the USA. At the Paris World Exhibition of 1937 he was awarded the Gold Medal for book illustration and in the 1961 he designed the official seal for President John F. Kennedy. In Germany Kredel is appreciated as the most famous pupil and collaborator of Rudolf Koch and as a favoured illustrator of the Insel-Verlag. In America he became famous as an illustrator of children´s and juvenile books. In the first part of this monograph 100 pages Ronald Salter surveys Kredel´s illustrative work with particular regard to its stylistic characteristics and his creative strategies in relation to the texts in hand. The second part of 96 pages is a descriptive oeuvre-catalogue of over 600 entries. It is a complete and systematic inventory of Kredel´s illustrative work, from his illustration of the "classics" to the pattern papers and dust jackets he designed. The book concludes with a literature survey and a register. It has 216 pages with 142 illustrations, most of which are colored. 214, 2 pages. orange paper-covered boards with Kredel's signet inset on cover on paper label. 4to..
John Howell for Books deals in new, used, and rare books in all fields and Western languages. We have been open for business in Los Angeles since January 1, 2005. We are constantly buying and adding new inventory. If you have any books for sale, we would love to hear from you. I am John Howell, sole proprietor of John Howell for Books. I am located at 5205 1/2 Village Green, Los Angeles, CA 90016-5207. I can be reached at info@johnhowellforbooks.com or 310 367-9720. I accept ABE Payments, Personal Checks, Money Orders, and PayPal. Books may be returned within ten days of receipt for any reason as long as you notify me prior to the return. Orders ship via USPS by noon Pacific time, usually on the same day orders are placed. Shipping costs are based on books weighing 2.2 LB, or 1 KG. If your book order is heavy or over-sized, we may contact you to let you know extra shipping is required.